Villisca: Living with a Mystery filmmakers Kelly and Tammy Rundle and historian Edgar V. Epperly joined Midnight Assassin: A Murder in America's Heartland authors Thomas Wolf and Patricia Bryan (shown above) at the Ankeny, Iowa campus of Des Moines Area Community Colleges (DMACC) Double Talks series on January 25-26, 2008. 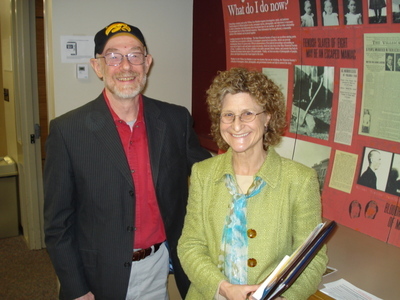 The two-day presentation was titled The World of Justice: Murder & Mayhem Within Iowa's Crimes and organized by DMACC professor Lisa Ossian. If you haven't had a chance to read their book or visit their website, please consider this a recommendation to do so. The book is a compelling Iowa murder mystery and an insightful study of the status of women in late early 1900s America. Yes, it's an axe murder in Iowa that predates the Villisca, Iowa crime by a dozen years. Are they connected? No, but these true stories still offer both intrigue and insight. Assassin reviews here. A more complete book review here. It was nice meeting you Thomas and Patricia. We wish you continued success with your fascinating book! 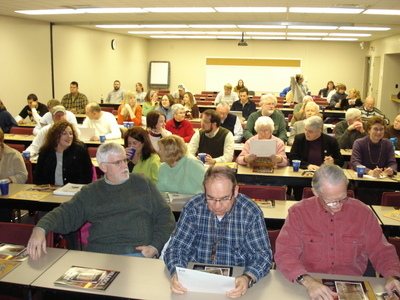 By the time the Friday, January 25, 2008 community college event started, over 90 people were seated with more standing in the back of the room.